What is Business Value then? The previous blog entry said that we should find the Business Values before writing user stories. Once we find the Business Values, we derive the User Stories from them. Why more than one Business Value? Where do we find the Business Values? How do we derive User Stories from Business Values? Let’s look at the first three questions and come back to the last two later. The Institute of Value Management defines value as “…based on the relationship between satisfying needs and expectations and the resources required to achieve them” and “getting what you require for what you will pay“. Jerry Weinberg (in “Quality Software Requirements volume 1“) says that “Quality is value to someone”. Robin F. Goldsmith (in “Discovering Real Business Requirements for Software Project Success”) says that “A requirement describes some value we need to deliver to someone”. So… if we “deliver value” we’ve satisfied a need or expectation of someone at a price they were willing to pay. We’ve provided someone with a benefit for a reasonable cost. Wikipedia defines Business Value as “…an informal term that includes all forms of value that determine the health and well-being of the firm in the long-run” and notes that it goes beyond purely economic value. Some theories (like “Shareholder Value“) try to reduce the different forms of value to one measurable value. I don’t think it’s as simple as that. An organisation is a complex system that’s impossible to reduce (or manage) with one measurement or goal. There will always be many (sometimes conflicting) goals, we might as well have these in the open. Other theories like “Balanced Scorecard” try to strike a balance between 4 different views of the organisation. How do we know who the relevant stakeholders are? How do we find out what their goals and needs are? Four views is better than one. But you’re likely to have more than four stakeholders for your project, so you’ll have more views. Define the relationship between the Value Drivers. Use the Value Drivers to focus and prioritise our work, from start to finish. It’s important to define the relationship between the Value Drivers. E.g. we may have both “profit” and “customer satisfaction” Value Drivers. Which comes first? If we find a way to increase our profit at the expense of reduced customer satisfaction, would that be acceptable? There is no right answer. It depends on the company, the project and the circumstances. Why agree on a Business Value Model at the start of the project? Because the Business Value Model models what your business values. Starting too many projects at the same time, trying to keep every customer happy. How does your organisation prioritise projects or features? Some organisations seem to value customer conflict avoidance above all else, leading to such unhealthy prioritisation schemes as “the customer who shouts loudest” or “the customer who shouted last” get to the top of the list. Sometimes a seemingly irrational prioritisation scheme hides some perfectly understandable values. For example, in one company, the official strategy was to deliver product releases that contained a good mix of benefits for our customers all over the world. In reality, some customers (who happened to know the phone number of the CEO) always got their feature requests bumped to the top of the list. These customers all came from the same region. This had a negative effect on customer satisfaction and consequently sales bonuses of the salespeople in the other regions. Of course, sales bonuses were another powerful and hidden value driver for product prioritisation. Everybody knew this; nobody talked about this. These old and loyal customers all had the CEO’s phone number, because they’d become customers long ago when the CEO did sales himself. They were all located in the same region because that’s where the company first started selling its products. Taking good care of your loyal customers is a perfectly valid business strategy, but because it was never articulated it created a dysfunctional prioritisation process. How can we measure/test those Business Values? How do we agree on the importance of Business Values? Let’s come back to these questions later. 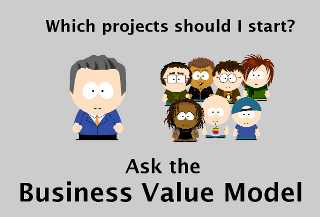 What is your definition of Business Value? 3 comments to What is Business Value then? This approach also plays very nicely with BDD and Kanban! Thanks for the pointers, Liz. I’ve talked with Chris about Feature Injection. Our approaches are similar, but we use different techniques to implement the approach. Feature Injection, Chris Matts and Andy Pols will feature in a future entry about how I’ve done business value modeling.